I was pretty bummed to hear about the closure of Sony’s Liverpool Studio this week. While they are primarily known as the studio behind the WipEout franchise nowadays, Sony Liverpool has a long and storied history that dates back to the early days of PC. Before they were rebanded in the early 2000’s, Sony Liverpool was known as Psygnosis, and they made some amazing games. 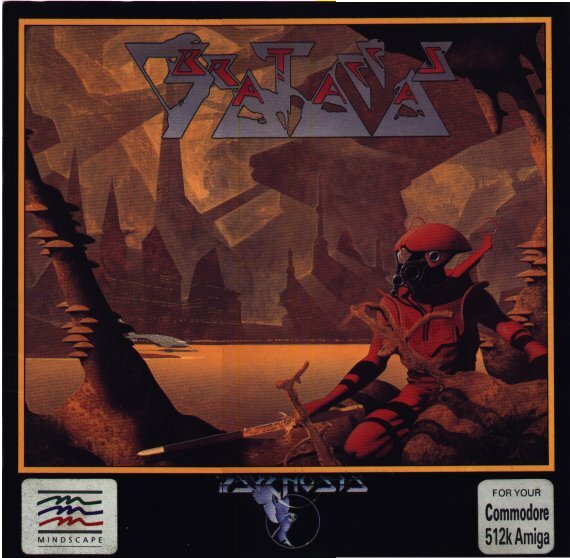 Of all the games that Psygnosis either developed or published, my favortie is their first one–Brataccas. Brataccas was a science fiction RPG in which you played a genetic engineer named Kyne that has developed a way to create super humans. When the government wants to use the technology to create soldiers, Kyne refuses and is branded as an enemy of the state. In order to clear his name, Kyne has to travel to a mining colony on an asteroid called Brattacus and gather the evidence that will prove he’s been framed. The project rose from the ashes of the infamous Bandersnatch concept that Imagine Software was planning to release as one of its “Megagames.” When Imagine went under, some of the key people from the studio formed Psygnosis. Brataccas was what became of Bandersnatch. When Brataccas came out for the Amiga in 1986, it actually got mixed reviews, mostly because the controls were pretty wonky and it was very buggy. But if you could get past those things (and I did), the game was absolutely amazing. It had an oppressive atmosphere that really got across the idea that you were in a remote place with everyone out to get you. The way the game displayed one room at a time on screen (kind of like Xenophobe) had me always worrying what was around the corner. When I did run into an Asteroid Belt Policeman (ABP), the encounters were quick and deadly. There was never a point in the game where I didn’t feel like it was a race against the clock to find the evidence I needed before the bad guys caught up with me. When I think of games that really nailed a sense of atmosphere, I would put Brataccas in the same group as Out of this World and Flashback. There is a feeling to those games that is rarely captured even in today’s era. In fact, I think the original Dead Space is the only one of the past several years that gave me that sort of experience. The video below gives a great overview of the game, and if you want to see the actuall manual from back in the day, head over to the site dedicated to Brattacas. 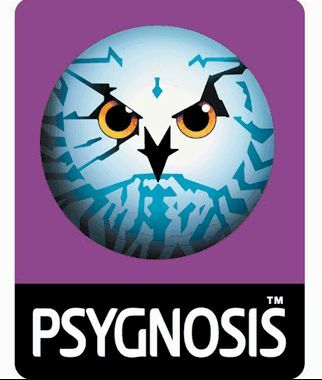 Maybe in the wake of Sony Liverpool’s closure, Psygnosis will someday live again. I wish all the people affected by the closure the best of luck. Twitter pretty much exploded this week when the folks behind the new Polygon gaming site launched a trailer for a documentary they’re taking part in. The series is supposed to chronicle how this group of forward thinking video game journalists have joined forces to create a new type of site and a new angle to cover video games from. Watching the trailer though, I couldn’t help but feel that this group of people is a shining example of what is wrong with video game journalism today. Personally, I don’t believe there is such a thing as video game journalism. I prefer the term “enthusiast press.” People who get paid to write about games are, in most cases, people who play a lot of video games and spend a great deal of time discussing them, because they are passionate about their hobby (or at least they started that way). They may be good writers, and they may have some interesting things to say about games that other gamers enjoy reading and hearing about. For many of us, being able to write about games and get paid for it would be a dream come true. I was lucky enough to be a member of the enthusiast press for a couple of years, and it was a great experience. But as cool as it was to gain early access to games, or get free review copies, or attend press events, I never once forgot my place in the grand scheme of things. I was the guy talking about something that someone else had made. And I really think that’s a perspective that a lot of people in the enthusiast press have lost sight of in the current era of game coverage. For many, it has become more about them than the games they are covering. It’s about them as a writer, or their unique “take” on something. It’s become about proving how superior they are because they can point out the technical flaws in a game, or how the writing is sub par, or whatever. It’s become more about building oneself into a personality as a game “journalist” than about covering the games themselves. And as someone who loves games, I hate how the state of game coverage has changed the way we all talk about the hobby we supposedly love. And I’m ashamed of the way the gaming community treats the people who make game for us. People who spend years of their life toiling away on a project, only to hear about how their level design sucked, or how “texture pop-in” somehow ruins the experience of playing their game. We have become pretentious, spoiled brats when it comes to the hobby we love, and the way video games are covered by much of the enthusiast press has perpetuated that type of discourse. So that’s why watching the trailer from the Polygon guys pretty much made me sick to my stomach. I wonder what people who are working their tails off making games right now thought about that, and about the current state of game coverage in general. I feel sorry for them. I love games, and even the most technically flawed, story-challenged games still have something awesome to offer. There was a time when most games were technically flawed and had not story whatsoever. They’re the games I grew up playing, and they are the main reason I still love games today. It would be nice to see a group of the enthusiast press get together and create a site that focused on what’s great about games, and covered games that weren’t AAA titles, and found the great things about bad games and wrote about why those experiences are worth having. The closest thing I can find to that now is the current 1Up, but I fear for how long they’ll be able to keep their current direction without either getting swallowed up or being forced to conform. Maybe at some point we can go back to enjoying games and talking about the things we love. And if I’m wrong, and Polygon turns out to be a celebration of all that is great about games large and small, then I apologize to the people behind the site .Everybody makes mistakes. I hope that’s all the Polygon trailer was. 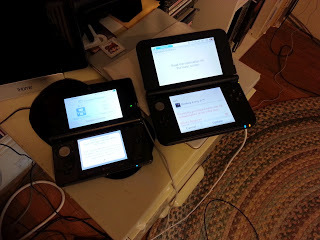 Even though I hadn’t really planned on it, I ended up grabbing a Nintendo 3DS XL when they went on sale yesterday. GameStop was offering $100 toward the XL if you traded in your old 3DS, and combined with some other games I traded in, I got the new XL for a mere $11. Turns out it was worth $11 and then some. I bought an original 3DS on launch day, and I haven’t played nearly enough to justify my $250 investment. My biggest complaint wasn’t the lack of games after launch, but rather the form factor of the device itself. The 3DS was just too darn small, and playing it for any length of time actually made my hands hurt. Over the past several months, there’s been some great games for the 3DS that I haven’t even bothered to pick up. I have a ton of old NES and GameBoy games on the device from the Ambassador Program and my eShop purchases, but I rarely fired up the handheld to play them. 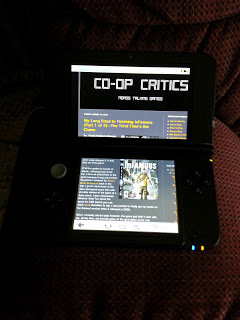 Ironically, the game I spent the most time with was Resident Evil Revelations (an awesome game), partly because the added bulk of the Circle Pad Pro made the device more comfortable to hold. My first thought in taking my new 3DS XL out of the box was that it was exactly what the original design for the device should have been. Not only is the display substantially larger than the original, but the device feels a lot more comfortable to hold and play. I fired up Super Mario 3D Land and was really impressed with how much better of an experience it was playing on the XL versus the original 3DS. Even the 3D comes across better. Reading web pages on the built in browser (not that you’d actually spend much time doing it) is actually reasonable now. I could actually see myself using Netflix on the device now, something I did one time on the old model. So, while I haven’t spent too much time with it yet, I am really liking the 3DS XL so far. I don’t know if the GameStop deal was a one-day thing, but if it’s still going on, I think it’s worth trading in your old model for this one. I know I’ll get a lot more playing time out of the 3DS moving forward. So, I finally finished inFamous, and I really enjoyed it. It only took me three years. 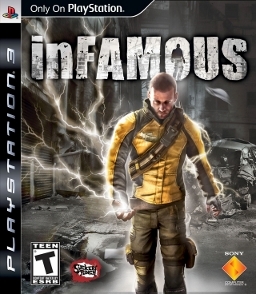 Of all the games in my pile of Shame, inFamous was at the top. I have an attachment to the game because it was one of first big games I covered for Comic Book Resources back in the day. I got to meet some of the devs and spend some time with an early version of the game at a Sony event. I even interviewed Director Nate Fox about the game for CBR (which you can read here). Needless to say, I was excited to finally get my hands on the finished version when it released in 2009. When I actually started play however, the game just didn’t click with me. At the time, my favorite game of the generation so far was Crackdown, and I kind of expected inFamous to be similar to it (the open world, super powers, shard collection, etc). But the game felt very different mechanically, and I couldn’t stop comparing the two. When the story didn’t grab me right away, and the mechanics didn’t click with me, I never got past the first five hours before trading in the game and moving on to something else. Fast forward to mid 2011, and Sony’s infamous (pun intended) PSN outage. As an apology for the PSN hack and subsequent outage, Sony offered inFamous as one of the “Welcome Back” gifts for returning PSN subscribers. I downloaded the game, fired up my old save, and jumped back in. This time around, the mechanics did click with me, and I was far enough removed from Crackdown that I could enjoy inFamous without constantly comparing it to my other experience. I put another five hours or so into the game, and made some good progress before getting distracted by other games and leaving inFamous again. Fast forward to June of this year, and Sony’s E3 press conference. Part of the conference was a rebranding of sorts for PlayStation Plus, which was being molded into more of a subscription game service, with users getting access to a selection games for free each month. 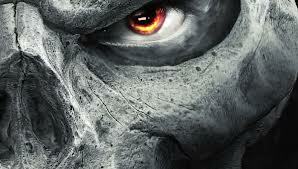 To kick things off, Sony offered free access to a dozen titles, one of which was inFamous 2. Feeling that I couldn’t possibly start inFamous 2 without finishing the first game, I dove back into inFamous, determined to finish it this time. Lo and behold, not only did I finally finish the game, but I really enjoyed my time with it. The power leveling system is great, and as I got closer to the end of the game, I had really customized my version of Cole (the game’s protagonist) to fit my playstyle. I’m more of a ranged attack guy, who likes to swoop in and finish enemies off after softening them from afar, and that style is totally supported by the game. I ended up enjoying the comic-y story as well, even though it took some big leaps of logic toward the end of the game. The entire story is a huge setup for a sequel, and I believe the events of inFamous 2 pick up almost immediately after the first game. All in all, lots of fun, and I’m glad I took the time to finish it. Finally completing inFamous got me to thinking a lot about how I approach games in general and how rarely I actually finish them. I’ll talk about that more in my next post. Some of my favorite games are absolutely teeming with originality, even if they use familiar game play mechanics, environments, or themes. Take Bioshock for example: on one hand, it’s a first person shooter and “spiritual successor” to System Shock 2 (see Kieron’s brilliant take on that subject) that doesn’t require the player to actually do anything they haven’t done before in a game. On the other hand, well, if you’ve played it you know that the story, setting, combat, and moral choices combine to make for one incredibly original experience overall. It’s not on the same level of my personal gaming pantheon as Bioshock, but the first Darksiders game is one of my favorites for a very different reason: entirely because of the success Vigil Games achieved by making one of the most wonderfully derivative games ever. The game’s structure and core mechanics? Yep, that’s Legend of Zelda. The combat? God of War lite. The story? The bible (a very loose interpretation, obviously). Heck, they even threw in a little Portal for one of the dungeons! What’s more, you don’t even need to look hard to find these sources of inspiration; hell, if THQ had offered a green tunic and cap costume as DLC for the game, Nintendo might have sued. And yet, they pulled it off. They took all those elements of great games & stories and did two things: they executed them with polish and precision, and they combined them in a way that made something new and fresh out of the familiar. In a way, Darksiders is like a DJ Earworm end-of-year mashup that lets you recognize a whole bunch of your favorite songs as they blend together into something that stands on its own. Even more impressively, they avoid the trap that some retro homage games fall into (I’m looking at you, 3D Dot Game Heroes) of being so slavishly devoted to the original that they fail to do anything new or worthwhile. So, yeah, Darksiders is a top-notch mashup of video games that also dives into Judeo-Christian mythology in a fun way. And based on the first 5 or 6 hours of Darksiders 2, Vigil has hit the sweet spot again… only this time they’ve added a healthy dose of Prince of Persia to the mix. Oh, and Diablo. If there’s kart racing in there somewhere, I may pass out. I wish I could say that I had been away for so long because I was fully immersed in clearing off my backlog, that my pile of shame has been leveled, and that the new games have my complete and undivided attention. But that would be a lie. One factor I had not considered when drafting the original gaming schedule was how time consuming finishing some of them would be. Another, slightly more important factor I had not considered was how quickly I would feel burnt out on gaming in general, and achievements-oriented gaming in particular, after a few months of this project. The most important factor I had not considered was how difficult it is to balance school, work, and family, particularly raising a toddler, would be. At the end of the day, I just didn’t want to play anymore. It turns out that once I popped (an achievement), I actually could stop. That said, it’s the redefinition of “completion” that accelerated my burnout. Last time, I mentioned that the pursuit of 100% completion derailed this project. We normally call the act of experiencing a game’s full plot or playing a game’s last level “completion.” But there are other difficulties and other modes to conquer, other challenges (self-imposed or designed by the creators) to overcome, other collectibles to discover. And therein lies the relatively arbitrary demarcation of “100% completion,” which I defined as “all achievements earned.” And that usually means some tedious play. “Tedious play” is a wonderful oxymoron. How can play, which is supposed to joyous, be tedious? It’s tedious when you’re leading a coordinated group effort to enter into buildings so an achievement boosting partner can demolish it, thereby scoring demolition kills in Battlefield: Bad Company 2. It’s tedious when you’re playing a particular checkpoint in Gears of War 2‘s campaign again and again so you can use the Brumak to score 100,000 kills. It’s tedious when you’re caught in a cycle of dying and respawning just so you can join Call of Duty 4: Modern Warfare‘s Mile High Club. And yet I’ll smile when I think about the moment when the Demolition Man, Seriously 2.0 and Mile High Club achievements popped. There is a group of us on XBox Live (including Co-Op Critics Dan Evans and Kim Wong) that have gamed together for the better part of five years now. We initially came together around Call of Duty: Modern Warfare in 2007, but the group really jelled with the arrival of the original Left 4 Dead in 2008. In fact, we put so much time into playing that game together, that we dubbed our gaming group ‘Team Zombie.’ To this day, whenever the call goes out over Twitter for some co-op gaming, the Team Zombie signal is shown in the sky, no matter what game we’re actually playing. Outside of Left 4 Dead and Left 4 Dead 2 though, our group doesn’t game together as much anymore. Part of the issue is shooter fatigue, which gets worse with each new iteration of CoD or Battlefield. But part of it is also that no games can quite match the Left 4 Dead series in terms of co-op fun. So when Valve finally brought he long-awaited Cold Stream update to Xbox on July 24th, it was a pretty big deal for our little group. And since its release, Team Zombie has been back in action, having as much fun as we’ve ever had with the game. 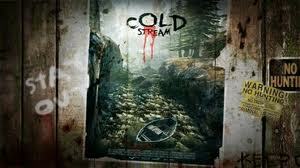 Cold Stream is great because not only does it bring a new level to L4D2, but it brings the rest of the maps from the original game into L4D2, and they’ve all been updated. Many of the ways we used to beat the old maps are no longer possible, as the levels themselves have been tweaked. This has made all of the maps feel new again, and it’s resulted in the laugh out loud, screaming and yelling sessions that brought the group together in the first place. So I’d like to thank Valve for Cold Stream, because it got the band back together. It was a long wait, but well worth it to be fighting for my life with Team Zombie again. WARNING–I am about to get a little spoilery about the Mass Effect story, so feel free to stop reading now. In my last post, I talked about why I love the Mass Effect games, and now I want to talk a bit about the narrative I created for my character. For that, I will need to spoil some story elements from all three games. Still here? Great. 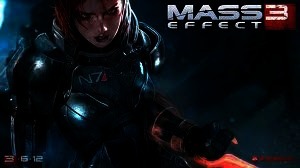 Beacuse I want to tell you the story of my Commander Aja Shepard. My Commander Shepard was a female marine who was the sole survivor of an incident that occurred on Akuze, a planet that humans were beginning to colonize when subterranean wormlike creatures called Thresher Maws attached and killed the colonists. A unit of Marines went in to investigate and suffered a similar fate, with Shepard being the only survivor. I chose this background for my character out a possible three backgrounds. I wanted a character that had been though some trauma, but had developed a mental and physical toughness that most others don’t possess. Humanity at this point is very new to the larger galactic community, and has just started to become a rising power. In the first Mass Effect, Shepard gets accepted into a group called the Spectres, an elite group that reports directly to the Citadel Council, the UN-like ruling body of the galactic community. 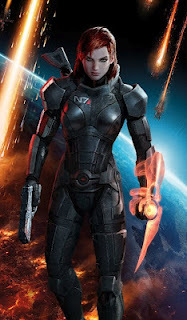 The first game involves Shepard investigating a rogue Spectre and uncovering a larger threat against the entire galaxy. As far as my personal narrative, I played my Shepard in the first game as a goody two-shoes, making all the “Lawful Good” (which ME calls Paragon) choices wherever I could. I focused on building my Charm skill (kind of like Charisma), so that I could talk my way out of many situations. My emphasis on diplomacy definitely affected a few key situations throughout the game, as I was able to open up dialogue options that would not be available to characters with lesser Charm skills. In addition to playing the good hero, I also developed a love interest with a alien female scientist Liara T’soni who was studying the ancient race that ties into the larger galactic threat. Of the rest of the NPCs that become potential party members, I most frequently adventured Tali’Zorah, with a female member of a nomadic race who was on her pilgrimage as a rite of passage to find information that she could bring back to people. When given the option, I partied up with my love interest and who became my closest friend, so I became close to these characters over the course of the first game. In Mass Effect 2, the larger story takes a sharp left turn, as pretty much everything you knew from the first game changes in the first hour. For much of the game, the characters you spent time with in the first Mass Effect take a back seat to new characters and crew members you meet through the second game’s story. The gist of the plot is that Shepard has to become allies with a shady humanist organization in order to combat the coming threat to the galaxy, because they are the only ones taking the threat seriously enough. My love interest became a secondary player in this installment, but I did meet up with Tali and was able to adventure with her for a good part of the second game. While I didn’t care for the larger story and how it was handled, I was able to continue my character’s narrative, which became about losing some innocence and making hard choices that changed my character. By the end of the game, I was less lawful-good and more chaotic good, caring less about the rules and more about results. Mass Effect 3 sees the races of the galaxy on the brink of extinction. Shepard has rallied everyone she can for an “all or nothing” final battle that will determine the fate of the galaxy, and its a battle against seemingly insurmountable odds. The decisions made over the first two games and part of the third all factor into the final battle, and the possible outcomes of that battle. The core characters that were back-burnered in Mass Effect 2 are brought back to the forefront, which I really liked, as I was able to get the band back together for one last go around. For me, the storyline with my love interest and my best friend had very satisfying conclusions, and ones that were close to what I had wanted to see. That’s what made the finale of Mass Effect 3 so satisfying for me–I was able to complete my character’s narrative in the way I had written it in my head. The developers had given me the framework of the larger story, but early into the second game, I knew how I wanted my story to end. I wanted to fight the final battle with the people closest to me, and I wanted my character to make the ultimate sacrifice in order to save the galaxy. And that’s the ending I got. I didn’t want to walk away cleanly, or be carried out on the shoulders of my comrades, or be given a parade–my Shepard’s story was always going to end in her death. It was the narrative I had built up over the course of the three games, and I played the entire third game with that in mind. There were conversation options about not making it through the final battle, and I always chose them. When I had to make decisions about being the nice guy or getting the job done, I chose the latter. my Shepard didn’t have time to mess around anymore. I was Lawful Neutral at this point–I had my own personal code, and I was sticking to it. The only laws I cared about now were my own, and people could either get on board or get out of the way. And in the end, the story concluded the way I would have wanted it to. My Shepard had a hard choice to make, and she chose the harder of the two options, which meant she would sacrifice herself (and some others) in order save the galaxy. It wasn’t a happy ending, but it was the ending that my Shepard’s story deserved. About a week ago, Bioware released an “extended cut” of the Mass Effect 3 endings, because a lot of fans complained that they were unhappy with how the game ended the first time around. The extra content did change a few details of how the final act played out, but for the most part just added some context in the form of epilogues, showing you what happened to different characters, what the state of the galaxy is post-conflict, etc. I was pretty happy with the added content, as it shone a little more light on the fate of my teammates, but I didn’t care for one of the changes, which actually reversed the deaths of a couple of characters that I felt fit well with the story the first time around. In any case, I really enjoyed my Mass Effect 3 ending the first time around, and that’s how my Shepard’s story ended. I applaud Bioware for creating a series in which I truly feel that I have told the story of my character. Even in all of the D&D campaigns I’ve been in, I’ve rarely gotten to see the story through to the end. Playing through the Mass Effect campaign is easily one of the best roleplaying experiences I’ve ever had, and for that, I thank you, Bioware. I’ve been reflecting back on the ending of Mass Effect 3 (and the trilogy as a whole) since finishing the game back in June. I couldn’t get the game out of my head for weeks afterward. More specifically, I couldn’t get the story out of my head, and I think it’s because I feel such a strong sense of ownership of the narrative that I helped create over the past five years. It’s that sense of ownership that makes me realize what a marvel the Mass Effect series is, both from a technical and a storytelling standpoint. In my personal experience, the Mass Effect series is the first series of video games that has truly managed to capture what is was like to play through a Dungeons & Dragons campaign to completion. For that reason alone, the Mass Effect games are my favorite video RPGs of all time. People like roleplaying games for a lot of different reasons, but the main reason I love them is because I love creating a narrative for my character within the framework that the person running the campaign (the DM) creates. In a good tabletop game, I am presented with the rules, the setting, the lore, and maybe even some recent events that serve as the launching pad for the campaign. I create a character within that framework, fill in some backstory, and decide which traits I am going to emphasize in order to play the character in a way that fits the narrative I’m creating for them. Over the course of the campaign, my actions have an impact on the story, and the relationships I form with other characters (both player characters and non-player characters) all contribute to my character’s overall story. While the person running the game has a larger story to tell and had a measure of control over that story and its outcome, I am creating my own character’s narrative within that larger story. It’s the dynamic that I just described that many video game RPGs fail to really execute on. Many games allow you to create your own character, some with a lot more customizability than the Mass Effect series. But it’s the ability to let the player tell their own story while still maintaining a strong connection to the overarching narrative the most games fail at. Most are too restrictive, offering the player no real room to create their own narrative. Those games may let the player customize the look of the character, but everything else about the game is very scripted. On the opposite end of the spectrum, you have games like the Elder Scrolls (which I am a huge fan of, by the way). The Elder Scrolls games feel at time to me like a D&D campaign with no one running it. They are a giant sandbox where you can create many narratives for your own character in the world, but you often feel disconnected from the story the developers set out to tell. I played through the Elder Scrolls IV: Oblivion twice (over 150 hours), once sticking almost strictly to the main storyline, and another time ignoring it completely. I loved the world and the myriad of things I could do within it, but the main story was never compelling enough to keep me connected to it. Mass Effect managed to keep the balance between my story and the larger story over the course of three games. It wasn’t perfect–there were times where the game almost became too restrictive, especially in Mass Effect 2, where I really disliked how the developers handled some of the storylines. But even when I felt the games faltered, it was mostly with the larger story. I was still allowed to play my character the in a way that was consistent with the narrative I had created. That held true right through the end of the trilogy, when I was able to end my character’s story in the way I had been envisioning it since early in the second game. That made for an incredibly satisfying end to the series for me, and one of the most cherished gaming experiences I’ve ever had. In my next post I’ll get a little spoilery, as I want to talk about the story of my Commander Shepard. And we’re back! We recently re-posted the discussion Dan and I had on Mass Effect 1&2, and we’re here to finish the job with a spoilerific Mass Effect 3 gabfest. Be aware, this is absolutely a spoiler-filled discussion that delves into the endings of Mass Effect 3, as well as the recently-released “Extended Cut” DLC.